Long Island Advancement of Small Business is a local networking organization that has the sole focus of helping your business succeed on Long Island. While our programs and events are designed to help grow your business we also work with local, county and state legislature to help the Long Island business community have a unified voice for your concerns and to protect your interest. 1. "springing back into shape, position, etc. after being stretched, bent or compressed." 2. "recovering strength, spirits, etc. quickly." Being resilient in body, mind and spirit is key to being happy and successful in all areas of life. Emotionally, it's the opposite of being "stuck in a rut" and it's about being positive. Physically, it can translate to strength and flexibility. Spiritually it can indicate faith with the ability to maintain hope in tumultuous times. It's about staying centered and grounded and making "right" choices. So, you may be asking yourself, how does one maintain emotional-spiritual equilibrium and resiliency when things can be unpredictable and often in crisis mode? How can we accelerate the resilience process? It's not easy, and takes some work. It's easy to create positive patterns and habits when life is going smoothly. It can be quite challenging while being swept away by negative forces. A good mentor/coach and practice is important, and the practice will create a "spill-over" effect into life situations. Many people, including myself, have learned how to be more resilient. There are skill sets of meditation, relaxation breathing, visualization and "tapping" (EFT- Emotional Freedom Techniques) that all add into helping an individual maintain focus and be positive. Exercising, eating healthfully and being in healthy relationships are naturally fortifying. Most people are not born resilient, but do have the capacity to learn how to be this way. * When you are feeling down due to personal circumstances, take stock of your strengths. Savor small triumphs, steps leading to the bigger picture. * Do not read, watch or listen to the news if you become "too upset". Author of "SOAR! 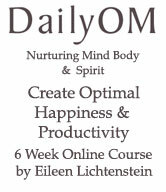 with Resilience", Eileen Lichtenstein, MS.ED.,EFT-ADV is President of www.balanceandpower.com. She offers complimentary coaching consultations via telephone and Skype and empowers individuals and groups to facilitate optimal levels of productivity and happiness.